Arkansas has announced that John Scott Jr will be the new defensive line coach. 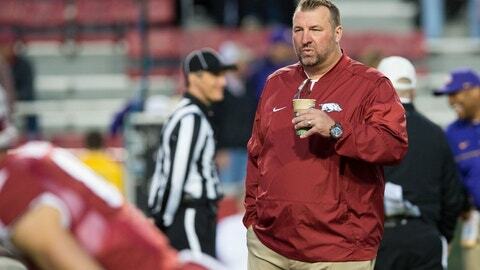 John Scott Jr. will be taking over the defensive line for the Arkansas Razorbacks football program. The announcement came via twitter on Tuesday at about 2:00 p.m. The coaching search didn’t last long after former defensive line coach, Rory Segrest left the program. Some media outlets were reporting it wouldn’t take long to make the hire but I don’t think anyone expected it to be that fast. Coach Smith has been the New York Jets defensive quality control coach since 2015. The fact that he is an NFL guy fits perfectly with the type of hires that head coach Bret Bielema likes to make. Smith started his coaching career at Western Davidson High School as the defensive line coach there in 2001. He spent 2002 to 2004 at Louisiana-Lafayette as a general assistant and then went to Norfolk State for the 2005 season as the DL coach there. From 2006-2007, Smith was the DE/OLB coach for Western Carolina and moved to DL in 2008. In 2009 he was the DE coach for Missouri State and from 2010 to 2012 was the special teams and defensive line coach at Georgia Southern. His only job at a power 5 program was from 2013 to 2014 as the DL coach at Texas Tech. Arkansas faced his defensive line in 2014 when Alex Collins rushed for 212 yards and Jonathan Williams rushed for 145 yards. Arkansas ended up beating TTU 49 to 28. The defensive line was a big issue for Arkansas last season. The inability to stop the run and contain a dual-threat quarterback cost the Hogs a lot of chunk yardage and bad losses. Woo pig.